Lee Kon­stan­ti­nou, Nov­el­ist; Assis­tant Pro­fes­sor in the Depart­ment of Eng­lish at the Uni­ver­sity of Mary­land; Asso­ciate Edi­tor for Fic­tion and Crit­i­cism, Los Ange­les Review of Books. Lee wrote the novel Pop Apoc­a­lypse: A Pos­si­ble Satire (Harper­Collins, 2009) and co-edited The Legacy of David Fos­ter Wal­lace (Uni­ver­sity of Iowa, 2012) with Samuel Cohen. Here at MultiWords we’ve peeked into the future and have seen the future of the Perfect Word. We bring good news. In the bad old days, stuffy modernist authors obsessed over words. They put great faith in the process of revision. They saw the construction of style as a special kind of creative labor. They thought they, like, owned their words. The Perfect Word served specific functions for the modernist writer. Some thought the Perfect Word perfectly matched an underlying reality. It showed the hard work the author put into the process of selecting it. It might affect you, the reader, in some precisely calibrated way. Whatever the reasons for choosing it, the Perfect Word was the word the author chose, the word the author imposed upon you. Postmodernists became suspicious of perfection. Words only ever stood in relation to other words, they said, in an endless chain of reference. Words were social constructions that had no necessary relationship to any underlying reality. Authors, not surprisingly, freaked out. Raymond Queneau’s Exercises in Style (1947) showed why picking a style was scary business. Exercises in Style renders the same trivial anecdote in ninety-nine styles. None of these ninety-nine is first or foremost. There’s no “original,” no authentic baseline. No legitimate way of picking the “right” style. Today, anxious authors have other problems. Perhaps the Perfect Word today is the word that gets top search results. Literary style might well be something more like Search Engine Optimization. Perhaps the Perfect Word is the word that gets the most retweets. Style would then be technology for winning a social competition for attention. We at MultiWords find these competitions somewhat dull. We’re sick of letting authors pick words. We’re sick of authors having crises. At MultiWords, you the reader will get to choose the Perfect Word. How awesome is that? Using MultiWords, the Perfect Word is the word you choose for yourself. Your reading level, your mood, your values will shape which version of the author’s word will make its way to your eyeballs. The Perfect Word will be the words you most relate to. The Perfect Word will be the word that speaks to the your unconscious needs. The Perfect Word will be the word that knows you better than you know yourself. The Perfect Word is nothing other than the word you want to read when you want to read it. My name is Lee Konstantinou. I’m an assistant professor at the University of Maryland, College Park. I study contemporary American fiction and culture, and I’m also a novelist. This is my second book sprint. What I meant was that the future of the book was as much a matter of human institutions as of technology. I wanted to bring a sociological perspective to the question of how we’ll write and distribute text in the future. I feel much the same way about the future of reading. I want to resist the tendency to discuss the future of reading, publishing, and writing solely in terms of technology, to fixate on the finished thing in front of us (whether p-book, e-book, or some hybrid of the two). Against this habit, I want to focus on questions of social process. What is a reader? What capacities do we think readers ought to have? What better models of reading should we promote? What values, assumptions, and ideologies—that is, what normative models of reading—shape the way we build and assess new reading technologies? How do our contemporary models of the reader compare with historical models? How do we become readers? How do readers come into the world? What are the educational, economic, governmental, and social institutions that make us into the sorts of readers we are? What forces shape our reading practices, communities, and capacities? What are the advantages and limitations of our current institutions of reading? Will readers flourish or whither away in the future? If we think, as many do, that reading is in crisis in the United States today, what is the nature of that crisis? What are its social, economic, political, and technological origins? What might we do to assess the scope of the crisis? How might we reverse it? These questions will, I hope, inspire debate. But I believe that the future of reading is in our hands—not in the hands of our machines. I’m here to participate in that debate. We’ve been writing about the future of the book without having given much thought to the question of what a book is in the first place. Is it a physical, papery artifact, a thing? An autonomous textual unit of attention made up of meaningful bite-sized subunits? A word whose persistence in language is merely a matter of convention, a residue of more bookish times? I’d like to propose that a book is a window onto a world. If this is true, we have good reason to believe that books will survive in a form that will remain recognizable to us. Books project worlds by objectifying thought. They freeze in place a story, a longish idea or a description of life. Books are one means of taking a world, real or invented, and compressing it, encoding it and presenting it. Books shrink space and crush time. So long as we enjoy shrinking space and crushing time, we’ll crave book-like things. Then again, in the same breath that they create worlds, books also destroy themselves. When I read a science fiction novel (and not only science fiction), I read for worlds. I define the word world as the sum total of relations – among things, characters, settings, laws, etc. – within a bounded imaginative space. If the book does its job, its bookishness will dissolve into the reader’s concern for characters and situations and plots. Even the most intensely avant-garde poetry (think Kenneth Goldsmith’s American trilogy) or the boldest experiments in book design (think Jonathan Safran Foer’s Tree of Codes) construct worlds. Even the most book-conscious books are finally self-effacing. Which might lead us to doubt that books need to survive. If I can watch a skillfully made rendition of Frank Herbert’s Dune, of what special use is the novel? It’s true, literary style is only one sort of window onto interesting worlds. But it’s a window with strengths and weaknesses, zones of clarity and opacity. Despite a century of efforts to do so, no novel will ever offer the visceral experience of a play or film or television show or video game. Contrariwise, non-literary modes of world-building still stink at dramatizing thought or deploying metaphor. Within the domain of prose fiction, moreover, short stories can only hint at the fullness of an imagined or real world, a job the novel does with ease. There are also economic reasons why books will likely survive. In an age of vertically integrated multinational media conglomerates, books remain useful as vehicles for the creation of worlds on the cheap, worlds that subsequently spawn other higher-margin worldish media products. A company like DC Comics sustains its comics division almost purely as a means of research and development for its profitable films. Film producers often outsource creativity to popular novels or book series. The book (whether of poetry, drama or prose) fits snugly in curricula and on syllabi at every level of education. Finally, the novel is still at the peak of the pyramid of narrative and cultural prestige. No other form comes close to capturing the imagination of a world-hungry public. These are forces that will, fortunately, be hard to dislodge. The future of the concept of the book is therefore the future of the book’s capacity to facilitate the reader’s access to worlds. As long as humans are hungry for fully evoked worlds that include figuration or densely packed information or renditions of characters (or people) whose inner lives are richly accessible, something very much like the book will survive. What Is the Future of the Editor? In his classic essay “What Is an Author?” Michel Foucault offered an analysis of authorship that questioned received ideas about authorial authenticity and originality. His essay describes authors not as persons but as a “function of discourse,” whether historical, social, or technological (124). Really, his essay ought to be called “What was an Author?” since he ends by saying that “We can easily imagine a culture where discourse would circulate without any need for an author” (138). You can’t help but suspect he’d prefer to live in such a culture. This is an alienating way to think of authorship, partly because the figure of the author turns out to be not someone who writes but rather someone who is, in a sense, written by circulating social discourses. Your former illusions of writerly mastery turn out to be an effect of your context. A lot of working writers might not find imagining such a world as “easy” as Foucault does. This way of talking may be less jarring if you realize that you, as an aspiring author or working author-function, are always also contributing to those circulating discourses. So it might be more accurate to say that the author doesn’t disappear in Foucault’s account, but in some sense gets smeared across a variety of locations, persons and institutions, joining a good old-fashioned cybernetic circuit. Which brings me to the question of my title. The first step in figuring out the future of the editor is to ask a prior, more important question. What is an editor? The editor, like the author, is also a function of discourse. But the editor also has a function. The editor’s job is to be a switching station, a resistant medium through which the writer’s message travels en route to readers (where we understand that reader and writer refer not to persons but to functions). Without the medium of transmission, communication isn’t possible. Without editorial friction or resistance, writers and readers instantly disappear. Writing wouldn’t be communication but instead be a sort of telepathy or merging of minds. So editing is an ineradicable part of what any author tries to do. It’s not only a good thing that editors exist, but logically necessary that they do. So the real question of the future of editing is the question of who will edit (not whether someone will edit). Online, writers get to be self-editors, and readers, via various channels (comments, click statistics) also act as various types of editor. The writer’s fantasy of escaping editors is just that: a fantasy. You are always being edited, always self-editing. The question isn’t whether you’ll be edited, but by whom and how. What future platforms will editing happen on? What forms of editing will these platforms encourage and discourage? How will editing be visualized, communicated, and incorporated into new drafts? We might be able to imagine a culture without authors – though I admit I find it hard too – but in any culture with authors we’ll never eliminate editors. Which is a good thing. We should, instead, celebrate them. And pay them, while we’re at it. Our Friend the Book D.J. In the future, book producers will not produce books. They will manage brands. Authors are already told they have to behave like brands. They need to run their own web sites, have a presence on popular social media sites, cultivate reader communities and market their own books (publishers won’t bother). Under such conditions, who needs publishers? Aren’t they little more than parasites on the reputation and income stream of authors? Won’t publishers wither away? No, they won’t. They’ll become more important than ever. Paradoxically, as it becomes easier for authors to establish direct relationships with readers, publishers will become more significant, not less. This will happen for two reasons, both related to their essential future function as brand managers. Because these likely future entities won’t resemble contemporary publishers, let’s stop calling them publishers. Let’s call them Autonomous Literary Imprints, or imprints for short. Readers will want imprints. Imprints will help them navigate the confusing, effectively infinite digital graphosphere. In my previous essay, I evoked the farcical figure of the Book DJ. Well, he’s back, and he’s here to stay. In his function as an embodied imprint, he may even be the same person running your local pop-up book retailer. His job is to have good taste. His livelihood will depend on his reputation. He will make – and break – canons. His stock will rise and fall with literary history. His culture will be his capital. He may, of course, be part of a multi-person imprint. Imprints may consist of one person or one million. They may interlock or be nested within each other. The point is, you will have a relation with the imprint. You will trust it as much as you trust your friends on Facebook or the people you follow on Twitter. Imprints are people too, not only legally but also as vibrant presences on social media. Writers, too, will need Autonomous Literary Imprints. In your role as a writer, you will look to imprints because they have the power to confer upon you a slice of their accumulated cultural capital. Earning the brand mark of the right imprint will shape your career. It will launch you toward fame or disrepute. It’ll determine whether you can get that university teaching gig that’ll pay your rent. Whether you’re invited to that posh writer’s retreat. Whether you can generate income streams from speaking engagements. Whether you’re invited to write essays for prestigious magazines and book collections. Whether readers will even (yes, it’ll still be possible) buy your books and (who knows) maybe even read them. More importantly, in your role as a writer, you will need imprints because you won’t know who to believe in the shark-filled marketplace for author services. Do you trust that freelance editor? That book designer? In the future, the imprint will be a kingmaker and a node of trust for various literary actors. The imprint will be an orienting map in a confusing supply chain of authors, agents, editors, designers and academics. In a field of production populated by a ragged surplus army of desperate, hungry, fame-seeking writers – in a world where more pretty good books will be published in one second than any reader can read in a lifetime dedicated to nothing other than reading – mediators will become more, not less important. So a popular techno-utopian buzzword like disintermediation is deceptive. It suggests that we’re moving into a world of no limits or controls. Instead, we’re moving into a world of total branding. Whether this new world is desirable or not is another question. I’m ambivalent about this likely future, but I’m sure our friend the Book DJ is pretty stoked. Is there a future for the bookstore in a digital age? Despite the death of independent bookstores, despite the failure of major booksellers like Borders and Barnes & Noble, I think the answer is yes. Bookstores may well survive, if we’re open to the possibility that they may not, strictly speaking, be stores or physically house books. It might be better to say that the function of the bookstore will persist, albeit in a new material form. Bookstores had an important mission: They physically distributed books to readers. They curated the books that they stocked. They guided individual readers to new books. They were (and still are) community centers, hosting readings, effectively serving as reading rooms, at their best creating not only readers but also reading publics. In what follows, I will assume the continued value of print books (see my previous essay, in the chapter “How will people read in the future?”). Beyond existing modes of distribution — indies, big booksellers, and mega-retailers like Costco — how will we find new p-books in the future? How should we? Here are a few suggestions. AMAZON STORE FOR BOOKS. Just as Apple has an Apple Store where it displays its sleek wares, Amazon might consider creating a bricks-and-mortar establishment meant to showcase its papery products. It’s possible, just possible, that customers will come into such stores, browse through physical books, and then decide to, you know, buy them. It’s a crazy idea, but if any innovative forward-looking technology company can make it work, Amazon can. BOOK POP-UP. As physical bookstores increasingly go out of business, we might imagine a version of pop-up retail for the book sector. Such pop-up stores would by necessity be small, but they could colonize existing retail spaces, either legally or (what would be neater) extra-legally. With the aid of social media we might organize flash bookstores, which feature curated collections of the very coolest books, past and present, all handpicked by what we might call Book DJs (let’s all agree not to call them Book Jockeys, for obvious reasons), whose reputations will depend on their meticulous taste. No self-respecting hipster should buy his or her book from any other sort of store. POD MACHINE. Some independent booksellers, like McNally Jackson in New York, have brought Espresso Book Machines into their store, allowing the printing of public domain books on demand. Such machines could populate many different retail locations, or even in time be part of every home. There’s also no technical reason that every book, both public domain and private, shouldn’t be available via POD Machine. Until technologies like 3D printing make it possible to print a high-quality book on demand in the home, let’s install a fast POD machine in every café in the land (Starbucks: I’m looking at you), set them up among vending machines wherever fine sugar drinks and fatty snacks are sold, and incorporate them into every airplane, where airline carriers can take their predatory cut from text-hungry frequent fliers. The whole human library should be available on demand, as a beautiful physical print-off, at any time. PUBLIC LIBRARY. A radically socialist scheme, the public library is a place where stuffy government bureaucrats purchase books using tax dollars, store these books and then make them available to the general public. In the future, public libraries may become a key resource for preserving literary culture, if rapacious capitalists don’t kill them off first. These are all ideas that could be pursued now, with a little bit of will, either on the part of private or public organizations. The future of the book is in our hands. We should make sure that readers can find the books they want, and that our institutions of book discovery work in their (that is, our) interests. 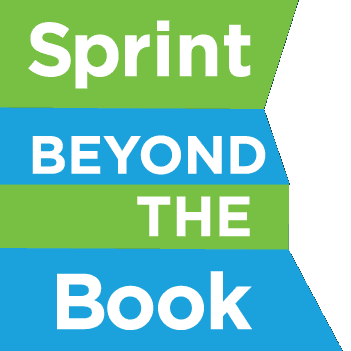 I bring two dif­fer­ent per­spec­tives to Sprint Beyond the Book. The first is the per­spec­tive of an author. My first novel, Pop Apoc­a­lypse (2009), is a near-future sci­ence fic­tion satire about a world where the Inter­net has been con­sumed by a new, closed plat­form called the medi­a­s­phere. As someone who likes to make fictional predictions, I’ve been think­ing a lot about the future of media. I’m also a literary scholar. In my academic work, I’m inter­ested in con­tem­po­rary Amer­i­can writ­ers, the rise of celebrity authors, and the rad­i­cal trans­for­ma­tions of Anglo-American trade pub­lish­ing since 1960. I’ve been impressed by new lit­er­ary schol­ar­ship such as Mark McGurl’s The Pro­gram Era (which is about the rise of cre­ative writ­ing programs) and by lit­er­ary soci­ol­ogy such as John Thompson’s Mer­chants of Cul­ture (which is about the social field of trade pub­lish­ing). These books show how profoundly the lit­er­ary field has changed over the last four decades. Pub­lish­ers have been con­cen­trated, often becom­ing sub­sidiaries of multi­na­tional media com­pa­nies. Agents and retail­ers have gained mar­ket power, squeez­ing the bot­tom lines of pub­lish­ing com­pa­nies. Authors, most of whom make lit­tle to no money from their writ­ing, have increas­ingly had to sup­port them­selves either through sec­ondary income streams (such as talks) or by seek­ing patron­age from insti­tu­tions such as the university. These trans­for­ma­tions affect what authors do – and what they can’t do. Insti­tu­tions are always leg­i­ble on the page. As a fic­tion writer, I’m inti­mately aware of how these pres­sures migrate into my every­day prac­tice. My abil­ity to write, and the con­tent of what I write, is hemmed in by the insti­tu­tional sup­ports, the com­mu­nity gathered around me, the assump­tions edi­tors bring to my man­u­scripts, the con­straints of the current book mar­ket and broader eco­nomic and tech­no­log­i­cal trends. That’s why we need to reimag­ine (and trans­form) pub­lish­ing as a field, not just as an indus­try, from pro­duc­tion to dis­tri­b­u­tion to con­sump­tion. We need to ensure that authors receive the sup­port they need, and that read­ers have access to well-edited, high-quality writing. What are the forms of support that allow authors to sur­vive and write well? What forms of men­tor­ship and career devel­op­ment are pos­si­ble today? Who creates and shapes reading publics? What direc­tion do we want to move in? These aren’t only academic ques­tions, but also questions whose answers should guide what actions we take in mak­ing a bet­ter future. We shouldn’t simply sub­mit to the mar­ket or to the allure of new tech­nolo­gies, but should make a new lit­er­ary sys­tem that works for read­ers and writers.